My husband I had a fantastic risotto dish out at a benjy’s restaurant that had a mix of grains in it. I loved the combination of flavor and texture that I just had to make my version of it! I chose to add bulgur which is similar to rice in that it is cooked similar and has a 2 to 1 ratio of liquid to the grain and is a blank palette to work with. It is different in that it has a nutty flavor and a chewy texture. I added a mix of mushrooms, but you can use any combination you want. However I do recommend the dried porcini mushrooms because the reserved liquid offers a more robust flavor. I also added truffle oil instead of butter, but you can use either. This is normally a meal for me, but if you want to add a protein feel free to do so. Give bulgur a try by replacing it with your rice dishes or replace it with any of our rice dishes. Serves 6. Boil 1 cup of water and add dried porcini mushrooms to reconstitute. This will take about 20 minutes. Strain mushrooms and rinse grit, saving the liquid. Strain the liquid through a paper towel into a separate large deep cup to remove the grit from the liquid and set aside. Make bulgur per package directions. It will take about 30 minutes. Using a large heavy pan, sauté the onions and mushrooms in the olive oil over medium high heat until translucent and mushrooms begin to release their liquid. Add the garlic and risotto and stir for about a minute. Add white wine and stir. Add porcini liquid and stir until absorbed. Add broth about 1 cup at a time, stirring frequently. I do not heat the stock, because I see no need to dirty out another pot and it really doesn’t make much of a difference to the dish. Continue adding broth until most is absorbed. This process takes about 30 minutes. Add porcini mushrooms at any time. 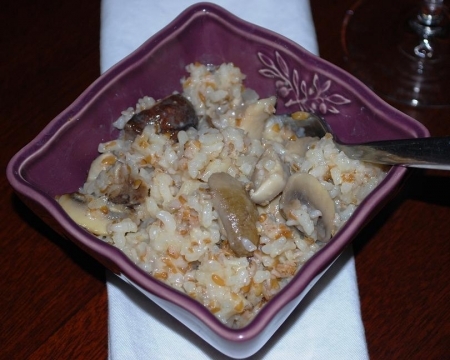 When risotto is tender stir in bulgur and truffle oil or butter. After butter has melted, stir in parmesan cheese. Ladle into bowls or serve family style. Try Masi Modello Delle Venezie (Italy), Sansilverstro Cantine Patres Barolo (Italy), Bogle Vineyard’s Merlot (California), J. Lohr Paso Robles Merlot (California), Healdsburg Ranches Appellation Series Pinot Noir (Russian River Valley), Flensburger Brauerei Pilsener Lager German Lager Beer (Germany) or Samuel Adams® Boston Lager® (Boston, MA).